First of all, thank you so much for all the compliments on our wedding invitations; it was slightly nerve-wracking to put them on the Internet like that, and we were so grateful for all the nice things you said about them. You should totally all come to the wedding. I'm sure Barack Obama will save a seat for you. Wouldn't it be hilarious, by the way, if he really did show up? What if he was all, "You know, I'm sick of saying no to these things. Screw it, this one we'll go to. Michelle, honey, get out your best hat!" Speaking of our wedding menu, one of the main things we did this past weekend when we were down in San Diego (again? yes, again!) was taste an awful lot of cake. I think I may have told you that my mother is baking our cake, but I guess I'd never really thought about how hard it might be. "Can't you just....bake three cakes and put them on top of each other?" I asked. Yeah, apparently you can't do that. Apparently there have to be dowels and things involved. Who knew, right? Well, I'll tell you who knew, a bunch of nice ladies in Florida whom my mother has befriended on one of her cake-baking message boards. No, seriously, there are cake-baking message boards on the Internet! And their members have been giving my mother a lot of advice about cake-making. So this weekend, she made enough cakes to feed a small Burmese village and we all sat down to eat them. And eat them and eat them and eat them. Oh Internet, we ate a lot of cake. We ate a whole lot of cake. It wasn't so much Let Them Eat Cake! as Let Them Eat So Much Cake They Explode! Sean even ate cake for breakfast. ON MORE THAN ONE OCCASION. We did, however, choose a few winners for the three tiers: vanilla cake with raspberry filling and vanilla buttercream frosting; carrot cake with cream cheese frosting; and chocolate cake with Baileys buttercream frosting. And the whole thing will be covered in vanilla buttercream. Can you tell I like buttercream? Buttercream, buttercream, buttercream. My mother thinks it's going to taste like an eight-year-old's birthday cake, to which I say just one thing: THEN LET'S SERVE IT WITH LIQUOR. Which is exactly what we're going to do: cake, coffee, and ice cold shots of Baileys. Another thing we did while we were down in San Diego was apply for our marriage license, which was simultaneously terribly exciting and also a little anti-climactic. I think I confused the clerk who helped us a little because I was wearing a white dress; she looked me up and down and said, one eyebrow raised, "So we're just doing the license today, right?" And then, like, three women walked past me in wedding dresses, two of them maternity wedding dresses, and I realized that pretty much everyone except us was actually getting married that day, not just applying for a license. And thus my ivory shift was a little misleading. Particularly since it was a little roomy in the tummy. By the way, if you have an hour to kill and yet not enough motivation to go see a movie, may I recommend just hanging out in the marriage department of your local municipal headquarters sometime? The people-watching is fantastic. I saw dads tying ties for their adult sons, nervous couples gripping each other's hands, lots of happy tears, and quite a few fabulous birdcage veils. What more could you want from an afternoon's entertainment? Oh, and we obviously got our marriage license. Hurrah for being legal! Well, almost. Filed Under: So When Are You Two Getting Married? Get your mum to go on the smitten kitchen blog and google wedding cake. She did this and has tons of useful advice. I hasten to add I didn't bake one of her wedding cakes but a birthday cake and she answered all my questions about the recipe. That's so funny, and very true! The people watching IS great! How on earth have I previously overlooked this culinary treasure?! No doubt Michelle and Barack will be there front and center. How could they pass up all that buttercream? I can't decide which of the three cake layers sound the best - I'm drooling over here and it's not even 9AM EST. I couldn't resist MINI CONES OF FRENCH FRIES WITH DIJON BASIL AIOLI, I don't see how anyone else could! You had me at raspberry filling. I feel slighted. Apparently the Atlanta marriage licensing bureau can't hold a candle to the San Diego one. All the entertainment we got was the slightly bored clerk explaining how hard it was to line something up on the form. Ooh, I LOVE Bailey's Buttercream frosting! You should go all out and make the whole tier an Irish Car bomb! (Guinness in the chocolate cake batter and an irish whiskey ganache filling... it's to die for!) I used smitten kitchen's recipe for the cupcakes and made it into a layer cake and it's still being talked about months later by those who enjoyed it! Sher... the chocolate cake recipe she's using is from Smitten Kitchen. The wedding cake post is the first link I sent her many months ago when she volunteered to make the cake. I wonder if it's someone's job in the White House Greetings Office to check off the regretfully declines box and mail back all those RSVP cards. Barack and Michelle just don't seem like the type of people who wouldn't send the card back! How exciting! That picture looks like one you will pull out on numerous occasions to show your kids. Very sweet. We got our marriage license at the same place. We went right when they opened and were the first people in line. The line wrapped aroudn the building and people were trying to cut!! Awww, congrats! I must seek out these cake-making message boards. And you can NEVER go wrong with buttercream. p.s. I really hope Barack and Michelle show up! Ahhhh, memories. 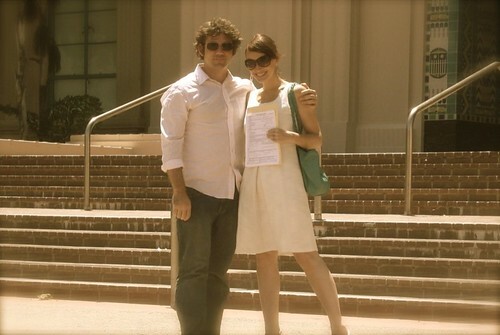 I (okay, WE) got my (OUR) marriage license at the same place. My sister got married a year earlier in San Diego, but since she lives there, she had a lot more opportunity to get her license. I, on the other hand, made two trips to San Diego in the year before the wedding, so we had to get our license the week before our wedding. My sister had told me horror stories about how long the line could be and how important it was to make an appointment in advance. We called the day before we wanted to go, got a nice comfy appointment time after lunch (no waking up early for me! ), strolled right in (and I feel I should mention that the security people there are the friendliest, happiest ones I have ever seen in my life), and walked right in to get our license. Because our appointment was at 1pm, right after the official lunch hour for everyone is over, we did have to wait a few minutes to go over to the assigned cubicle, which gave us time to people watch too. There was one big party waiting in the hallway - parents, kids, the works. There was one couple by themselves, and the bride was wearing an adorable short dress with shoes that looked EXACTLY LIKE MINE. After we were called to the window, I thought no sweat. We already filled out the form so there was nothing left for us to do but pay. I don't know if this girl was feeling the food coma aftershock of lunch or what, but she spelled my first name wrong, then had my address wrong, and then one more thing. She was very cheerful about fixing all her mistakes though. All in all, the easiest, fastest, most painless thing I've ever had to do involving the government. If you can, drop off your completed license personally after the wedding (or have someone in your family do it for you). Some people who said they mailed theirs (using the pre-addressed envelope) later tried to get copies of their certificate only to be told the office never got their paperwork. I'm crossing my fingers that one of the Obamas shows up, if for no other reason than to dip some of those delicious french fries into the Bailey's frosting. Mmmmmm. I never knew about the cake dowels until I watched one of those Food Network challenges. When I saw them pounding pieces of wood into the cake, I started shrieking, "What are you doing to that poor cake?" I didn't realize you had to stake it like a vampire to keep it from coming apart. It made me feel a little bad for the cake, frankly. Then I remembered I was just going to cut into it and shove it in my face and a few pieces of wood didn't seem quite so bad anymore. We had a bunch of wedding cake leftover, so my entire family was eating cake into the wee hours of the night, as well as for breakfast. Nothing like chocolate cake with strawberries and custard first thing in the morning. My husband and I got our marriage license at a small town village in North Carolina. The woman directing the signing and reading and stamping leaned over the desk at us and in a threatening voice informed us that this was a LEGAL DOCUMENT and that it was AGIN' THE LAW to LIE (pronouced LAAAAH) on a LEGAL DOCUMENT (pronounced DOCK-YOU-MAY-ANT). It was kind of like those FBI threats at the beginning of every movie on DVD, only much scarier. You'll know who I am when you see my email address, but I want you to know that I eloped to a lovely courthouse, and was the only one there who wasn't, shall we say, being nudged by a shotgun? It was a lovely event, despite the waiting area's inhabitants, due in large part to a judge who actually cared about what he said to each couple. Also? My marriage license was obtained at the only venue that had expanded hours that we could work in to our work schedule - the county jail. Nothing like signing things and crying tears because I never considered that getting married would include bullet proof glass where bail bonds were also posted. Seventeen + years later I can laugh at it, but I'd rather have the cute picture you have! I second the Smitten Kitchen advice. That site it amazing, plus has anybody seen the lobster on the flakly roll?! That much cake, and BUTTERCREAM, is like my idea of heaven! Bailey's buttercream frosting? HEAVEN! And with a shot to boot!